Hint: The book & deck set is worth the extra $15.00. Number of cards in deck: 79. The extra card shows Hermes. Measurements: 3.07 x 5.03 inches, or 78 x 128 mm. Back of card: An ornate engraving, black on white, with three small touches of red, for emphasis. (Similar in detail to the old Bicycle poker decks.) May be inverted. Booklet included: Yes, 3.1 x 5.03 inches, or 79 x 127 mm, 32 pages. The little booklet is not included with the deck & book set, and, though adequate, lacks the delightful "cattiness" of the book itself. Publisher: Magic Realist Press Ltd. Printed in the Czech Republic. Comments: A fun deck for cat lovers, in the Rider-Waite style. As is mentioned in several places, A note on why NOT to try this at home. All the images were done using models that were digitally combined with photographs of cats. No cats were harmed in any way. Please don't try really dressing any cat, they don't like it! You can get just the cards by themselves, but the book that comes in the set is a joy in itself. Includes the tradition of cats in clothes (world-wide & centuries old), a short history of the tarot, and cats and tarot. 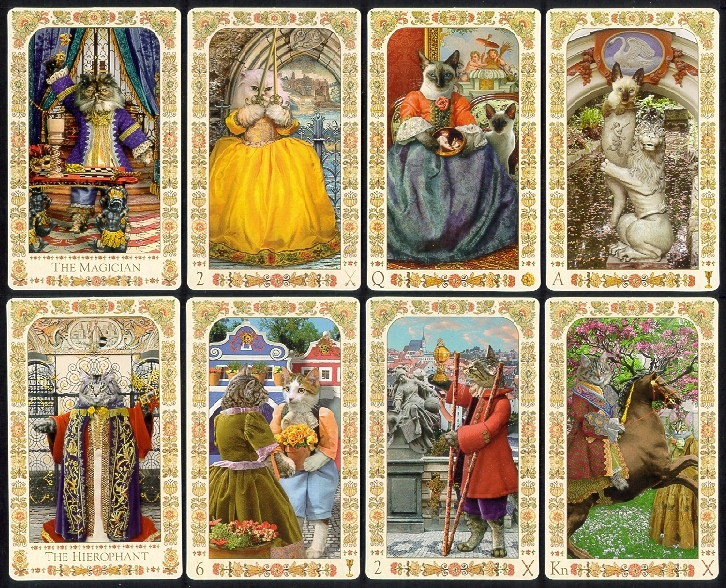 Each of the 78 delineations includes A Cat's Interpretation, and also, notes on the source materials shown on each card. These include breeds & location of various architectural details (mostly in Prague itself). Many of the delineations conclude with amusing cat-inspired quotes & proverbs, such as the German, Eat like a cat, drink like a dog. There is so much beauty in Europe, even after all the wars. Makes me wonder why people ever left there to come here. With their heads firmly on their shoulders, Mahony & Ukolov have created an amusing, delightful, fun deck & book. I enjoyed them both.